‘No-Pants’ Work Day—a Stupid Idea, Right? If Vancouver can have its annual naked bike rides as its contribution to the World Naked Bicycle Ride and seemingly sane Boston, New York, London and other big-city subway riders get on board with global “No Pants Subway Ride” day, why not a “No Pants Workday”? Given that mobs of subway riders, apparently mostly Millennial, remove their trousers, slacks and skirts after boarding a subway in mass “breeches” of the accepted social contract, you have to wonder whether these celebrations accomplish or embody anything that may be of value if applied in the offices where the riders currently or prospectively will work, when most of what could be called the “partici-no-pants” look employed or employable. Indeed, some among the pantless subway mob I’ve seen in photos and clips were otherwise impeccably attired in 2-out-of-3-piece suits and comparable business attire, or otherwise appeared to be dressed for work. Why a No Pants Subway Ride? “The No Pants Subway Ride is an annual event staged by Improv Everywhere every January in New York City. The mission started as a small prank with seven guys and has grown into an international celebration of silliness, with dozens of cities around the world participating each year. However, it is to be presumed that the participants in either the Naked Bike or No Pants rides draw the line and put on and pull up their drawers before they get to the office after the 1-hour ride. But, why draw that line? To answer that and determine what merits the idea of a “No Pants Wednesday” may have, if any, it’s useful to ask why anybody would want to cross that line in the first place—no matter where and what that place may be. Perhaps a look into the probable motivation may shed some light on the probable consequences, especially those arising from workplace reactions and policies. 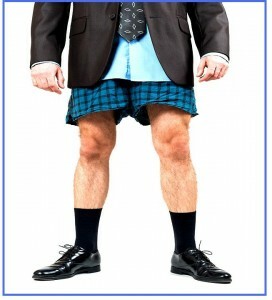 The idea of a “no pants” workday has its implemented precedents: Having, while in Scotland, addressed a similar question about workplace kilts in my analysis “Why Not On-The-Job Tartan Kilts and Suits?—the Case Against Plaid at Work and in Nature”, I see the “no-pants” issue as an extension of that, given that a kilt is as close to no-pants fashion as one can get without getting into big trouble. Is It All about “Freedom”? With workplace implications in mind and indulging in what is admittedly speculation, I suspect that the motivations for participating in pantless or naked rides primarily focus on one thing: to simulate, stimulate or exploit freedom. Some people feel more vulnerable with less clothing; others feel freer. So, allowing for the complexity of human motivation, it is possible that some participate in order to battle their shyness and vulnerabilities, and thereby liberate themselves, while others, not the least bit inclined to feel vulnerable, aim to celebrate, validate and promote freedom, if not also themselves. Others, perhaps convinced that freedom is, as cartoonist Julius Pfeiffer once put it, “the right to choose your own jail”, hope to accomplish nothing more than to either simulate freedom or to [im]modestly protest their lack of it. To paraphrase the lyrics of Janis Joplin’s “Me and Bobby McGee”, in their minds, it may be that “‘Freedom’’s just another word for nuthin’ left to lose—except your underwear, if you’re wearing any”. Hence, from this hopeless perspective, a No Pants day amounts to a redecoration—or “de-decoration”—of one’s jail cell, an impotent rattling of the cage or a probably pointless incitement to riot. 6. “Narcissists”—those, who convinced they have great bodies, or at least great legs, want the freedom to prove it to the world. At the risk of imprecision, those who are merely vain are included here—the difference being that the vain, hoping they have great legs, want public proof in the form of admiration, respect, getting hit on, etc. Narcissists are almost the same, except that they are expecting, not hoping for, that kind of attention. 7. “Deniers”—those, whose legs and bottoms look better at the bottom of a pool or when covered, seek to deny the importance of how they look, through fearless display, thereby liberating themselves from the burdens of conventional norms of beauty as well as of conformist behavior. In another category of denier are those who simply want to deny that appearing in public with or without pants is, in either case, a big deal. However, concealed within the deniers’ ranks are crypto-conformists who buy into the mainstream idea that not wearing pants is a really big deal, while wearing pants is not. Presumably, anyone wanting to participate in a No Pants day at work is almost certain to fall into one of the aforementioned seven categories. Knowing which category an employee belongs to can provide employers with very useful information that personnel tests are designed to extract. Hence, an employer could consider endorsing the idea of an annual No Pants day, to coincide with the No Pants rides and see which employees show up pantless and how they handle it. In some organizations, if no one does, it will presumably be a bad sign, e.g., in avant-garde art galleries, creative departments of advertising agencies or at Saturday Night Live and The Daily Show pre-show meetings. On the other hand, if anyone shows up pantless on an IBM-approved No Pants day, at a company that has a history of prohibiting any shirt color but white, a high turnout will tell IBM management that its customary, more conservative dress codes are reflective only of the mindset of management, not of IBM’s partici-no-pants or that well-disciplined and controlled employees will obey every suggestion, as well as every rule. “At a big management meeting, in an offsite location (probably Williamsburg), Watson Jr. pulled a trick. He deliberately had Y. P. Dawkins (V.P. Eastern Region Marketing) arrive at the cocktail hour in a sports jacket, while he remained away. Further opportunities and tests could be devised to identify more precisely which of the six categories the employees belong to. For example, it could be extremely useful for management to be able to distinguish innately or issue-motivated “crusader” employees from “protestor” employees—the latter, as I’ve defined them, hoping to secure rights and freedoms for themselves as well as for others. The reason is that a “protestor” may be more likely to stay and inflame the course when faced with punitive sanctions or disapprobation at work—for example, when demanding equal pay for equal work for herself as well as others. This is opposed to a “crusader” quite satisfied with his own salary, but sympathetic to the plight of others, that is, assuming the kind of self-interest that is believed to dominate our decisions and actions. So, how could a No Pants day be used to test or differentiate them? One simple scenario is this: Make a No Pants day mandatory for everyone but management. Any manager who protests is obviously a crusader who may be easier to deal with than any group-minded protestor who is not exempt. Self-centered protesters who are therefore not crusaders, may be silenced by being granted an exemption. Now, of course, this application of a No Pants day sounds impractical—indeed, really silly, like a Monty Python skit. … if not sartorial “load”.